The battery is very common to fail. Sometimes one of the electrical components that was left on or has a defect causing parasitic current draw drains the battery. Sometimes, an old battery can just die one day, with no warning. In either case, if the battery is low on charge, it won't have enough power for the starter motor to turn over the engine. If the battery is low on charge, when attempting to start the engine you might hear a single click or repeated clicking, or the starter may turn over slowly and stop. Poor connection at the cable terminals can cause the starter not to work or run very slow too. Often the battery terminals or the ground cable connection get corroded causing starter problems (see the photo above). Another part that often fails is the starter motor itself. Sometimes the carbon brushes or some other parts inside the starter motor wear out and the starter motor stops working. For example, a failed starter motor was common in some Toyota Corolla and Matrix models. Even with a good battery, the starter would click, but would not turn over. If the starter motor is faulty, it will have to be replaced, which may cost from $250 to $650. Rebuilding the starter motor is usually cheaper, but takes more time. Sometimes the starter gear for some reason won't mesh properly with the engine flywheel. This may cause a very loud metal grinding or screeching sound when attempting to start the car. In this case, the flywheel ring gear needs to be checked for damaged teeth. An ignition switch also fails often. The contact points inside the ignition switch wear out, so when you turn the ignition switch to the "Start" position, no electric current is going through the starter control circuit to activate the starter solenoid. If jiggling the key in the ignition helps start the car, it's possible that the ignition switch is defective. A neutral safety switch also can fail or get out of adjustment. For example, if a car starts in "Neutral" but doesn't start in "Park," the neutral safety switch should be checked first. 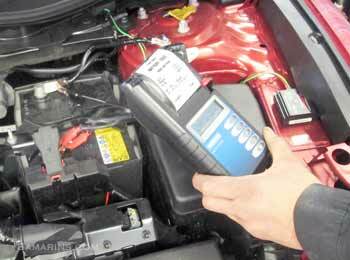 When the starter motor doesn't work, first the state of charge of the battery, battery terminals and battery cables must be checked. 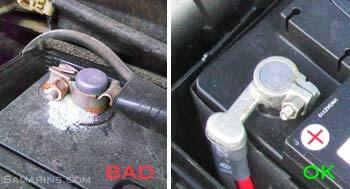 One of the symptoms of a weak battery is when the dash lights go dim when the key is turned to the START position. How does the starter motor work inside? 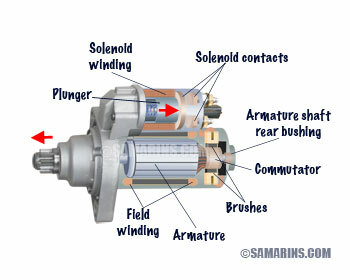 The starter motor has typically four field windings (field coils) attached to the starter motor housing from the inside. The armature (the rotating part) is connected through the carbon brushes in series with the field coils. On the front end of the armature, there is a small gear that attached to the armature through an overrunning clutch. This part is commonly known as the Bendix. How does the starter motor work? When the driver turns the ignition key, the solenoid winding is energized. The solenoid plunger moves in the direction of the arrow and closes the solenoid contacts. This powers the starter motor. At the same time, the plunger pushes the starter gear forward through the lever. The gear then engages with the ring gear of the flexplate and turns it over. Most of the starter problems are caused by worn out or burned solenoid contacts, worn brushes and commutator and worn armature bushings. 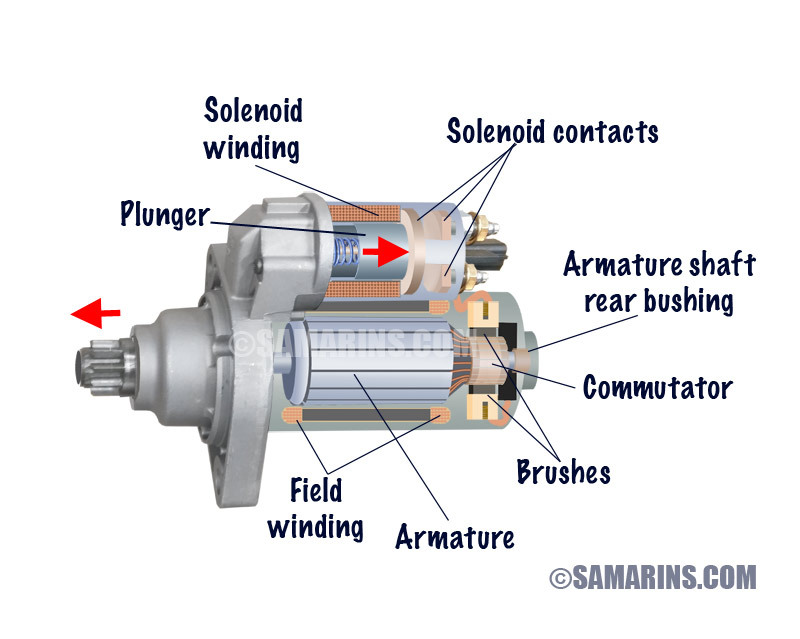 The symptom of worn out solenoid contacts is when the solenoid clicks but the starter motor doesn't run. When the starter brushes are worn out, the starter motor doesn't run at all. 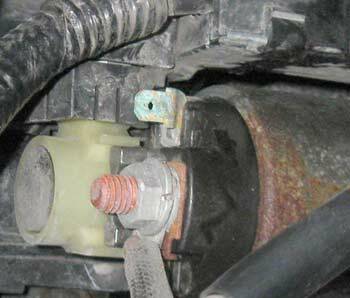 When front and rear armature bushings wear out, the armature rubs against the field shoes causing the starter motor to run slow and noisy. Many modern starter motors have small ball bearings instead of the bushings. Please note: the information provided in this article is for informational purposes only and cannot substitute for the advice of professional mechanic or authorized dealer. Consult your mechanic, and check your car's owner's manual for safety measures, precautions, warnings, tips and recommendations.